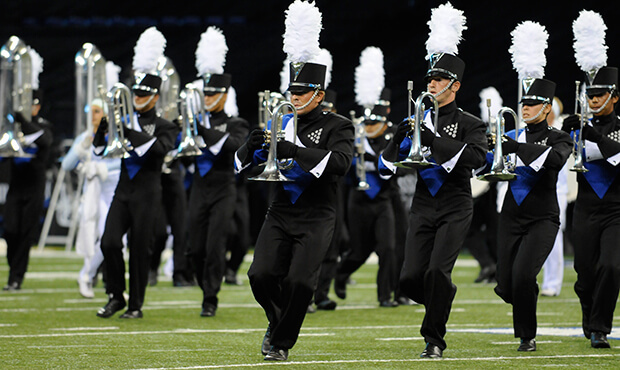 The 2009 Drum Corps International World Championships were the first to be held at Lucas Oil Stadium in Indianapolis. Undefeated, the Blue Devils scored perfect scores from three of the 10 judges to win the corps' 13th DCI title with "1930," also capturing four of five caption awards. Carolina Crown took the High Music Award and 2nd place and the Cadets changed their name to Holy Name Cadets in celebration of the corps' 75th anniversary. Though temperatures soared near 90 degrees that week in Indianapolis, the Blue Knights' 11th-place show, "Shiver: A Winter in Colorado," helped cool things down inside the stadium, exploring the beauty and perils of the coldest season in the corps' home state. The show opened with a snow flurry of cascading drill formations in "Whiteout," loosely based on themes from "Winter (L'inverno)," the fourth and final segment from Antonio Vivaldi's most famous work, "The Four Seasons." After the opening segment, a flurry of descending percussion mallet runs created the mental image of snowflakes falling, leading into a dramatic fanfare loosely based on the melodic content of the three movements in "Winter." The field was covered in the shimmering white purity of a Colorado snowfall, as if glistening in the moonlight, with white iridescent flags and the color guard members equally glistening in white snow jackets with baby blue sleeves. Corps arrangers Russ Newberry and Jeff Ausdemore composed "Glide," presenting the sense of both skating on a frozen pond and hurtling down a slope at an ever-increasing speed. The corps members' arms began erratically shaking as if shivering and their legs wobbled from the biting cold, fighting to stay warm and upright during a brisk, blowing wind. The work ended with the corps in the form of a giant eight-pointed snowflake. The segment titled "Fireside" captured the warmth of skiers relaxing next to the hearth, utilizing "Landslide," the 1975 hit written by Stevie Nicks for the album "Fleetwood Mac" by the group of the same name. It was the band's 10th album and the second album of that same title (often referred to as Fleetwood Mac's "White Album" to distinguish it from the earlier effort). Nicks wrote the song while visiting Aspen, the Colorado ski resort a couple hours west of the Blue Knights' hometown of Denver. It's said that looking out to the Rocky Mountains inspired her to ponder everything going wrong in her personal and professional life, thoughts that she poured into the lyrics. Utilizing imagery of which the corps would borrow, she later spoke of "…the avalanche of everything that had come crashing down…my life truly felt like a landslide in many ways." The album reached number one on the Billboard charts and was certified as five-time platinum by the Recording Industry Association of America, meaning it sold at least 5 million units. The corps' rendition didn't dwell on the angst in the tune, rather it played off its tender elements with the guard members making snow angels on the field. While Nicks spoke of a mental avalanche, the next segment was actually named "Avalanche." This segment featured "Tarantella" (Movement IV from "The Blue Room and Other Stories"), written by Phil Kline, a composer fond of creating collages of sound by utilizing masses of chords and multiple boom boxes. A tarantella was originally a hypnotic Italian folk dance, often accompanied by tambourines. This movement, the final one of the suite, stirred up dark musical colors and a foreboding sense of impending doom. Unaware of the coming avalanche, the color guard members utilized ski poles to propel themselves down the slope, poles that they later twirled. Visually, another lone snowflake grew into a large ball of snow, the tight ball of horn members rolling down the mountain during a drum feature, hurtling toward the front sideline and breaking apart upon crashing against the front of the field. The show ended with "Solstice," based on "Coronation" from "Stardust," a movie score by English film composer Ilan Eshkeri for the 2007 British-American romantic science fantasy that starred an extensive number of famous actors and actresses. His work for the film won him the International Film Music Critics Association award for Best Original Score. Spring was arriving, the snow was melting, and the creeks ran dramatically brisk with the icy torrents of melting snow from the tops of the Colorado mountaintops. 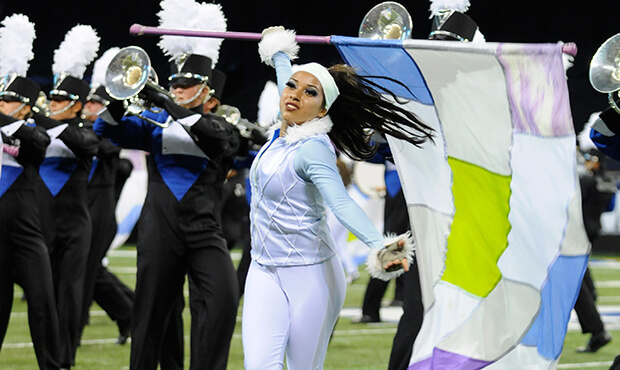 For this week only, you can save on the World Championship DVD set that contains this complete Blue Knights performance, along with all finalists from the 2009 DCI World Championships. Buy the 2009 World Championship DVD set. (Available this week only for 20% off. Regular price: $49.95.) Discount DVD offer ends Monday, July 28.